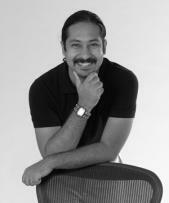 Rajat Shail is a Lead Product Designer for Global Consumer Design at Whirlpool Corporation in North America. His past experience ranges from architecture to product design, having worked on projects for large corporations like Motorola, Steelcase, Mattel and Whirlpool, as well as smaller design consultancies in India and North America. A graduate of Indian Institute of Technology in Bombay and Institute of Design at IIT, Chicago, his design approach transcends tangible product design to the innovation of new methods, services and systems. He is a recipient of the prestigious Inlaks Scholarship and Moholy-Nagy fellowship.